[Kyle McDonald], working collaboratively with [Golan Levin] at the Studio for Creative Inquiry, has come up with an application that can produce autostereograms. These are pictures that appear to be three-dimensional thanks to a visual illusion created by forcing your eyes to adjust focus and vergence differently than they normally would. The program is called ofxAutostereogram and it comes with a couple of examples. Both are show in [Kyle’s] video (embedded after the break), starting with a depth image of a shark. This combines with a texture tile, then is processed through the openFrameworks software in the package to produce the final image. If that’s all it did you might find it rather unimpressive… these images have been around for some time although they were never so easy to produce on your home computer. But the second example is a pretty fantastic one. 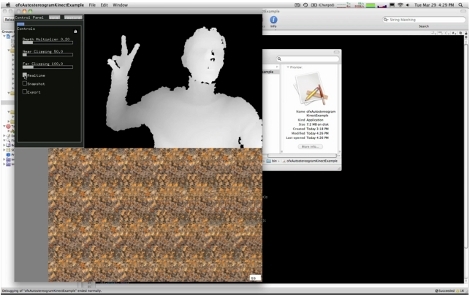 You can use a depth image from a Kinect as the starting point. As seen above, there is a preview window where you can adjust the clipping planes in order to include the correct depth. This also allows you a preview of your pose. Once it’s just right, snap a pick and process it through the software. I still can’t see that motherfucking sailboat!! I could NEVER see those #$#@#$ things! Not once! The problem with live update is just that the temporal correlation makes it seem like the tiles are sliding sideways. He could fix it by using a randomly generated, temporally uncorrelated, pattern. Chuck Glasser has added a new project titled GPS Goat. kaustubh chaudhari liked Axiom: 100+kW Motor Controller. Andreas Kodewitz liked Astrophotography Camera Mount.